Tanging Yaman Foundation, Inc. (Tanging Yaman), a non-profit Philippine organization, was established in 1992 when Fr. Manuel "Manoling" Francisco, SJ first performed his original liturgical music with the Philippine Philharmonic Orchestra (PPO). Almost every year, Fr. Manoling would perform with the PPO or the Manila Philharmonic Orchestra. These concerts, entitled Tanging Yaman: Himig at Pananalig, graced the Cultural Center of the Philippines, the Meralco Theatre, the UP Theatre, and other major Philippine theaters. The concerts even went on tour to Batangas, Quezon Province, and Ifugao. In addition to the orchestra, these Tanging Yaman concerts featured choirs like Bukas Palad, Hangad, Bungang Himig, Tinig Barangka, the Pansol Choir, and popular artists like Basil Valdez, Dulce, Ogie Alcasid, Ariel Rivera, Jamie Rivera, and Nolyn Cabahug. Apart from celebrating Filipino music and Filipino faith, the concerts also raised funds for institutions that build and nurture local communities. Some of the beneficiaries of the Tanging Yaman concerts were have been the Sibol-Hesus School for gifted public school children of Mr. Onofre Pagsanghan; the Alagad ni Maria Youth Center in Infanta; the Quezonians Home for the Aged; the Kiangan, Ifugao Scholarship Fund; the Diocesan Seminary in Lipa, Batangas; Our Lady of the Pentecost Parish in Loyola Heights; Mary the Queen Parish in San Juan; the Ateneo de Manila High School Scholarship Fund; and the School of Living Tradition in Benguet. Tanging Yaman Foundation, Inc. has then evolved from being an annual liturgical concert to being a conduit foundation, bridging the generosity of countless Filipinos here and abroad to the vital needs of their fellow men and women in the Philippines. Tanging Yaman believes in two things: first, the transforming power of the biblical “widow’s mite,” and second, the grace of God who blesses our every effort at helping our brothers and sisters in need. A mite is the Roman coin of least value during Jesus’s time. In the parable found in Luke 21:1-4, we find Jesus praising the widow’s act of putting in her two mites in the temple’s treasury, saying that the widow has in fact given more to the temple than anyone who donated there before her. this act is coupled with the belief that God loves and blesses our acts, however materially small they may be, and transforms it to be able to effect significant change in the lives of the least of our fellowmen and women. Tanging Yaman’s belief is rooted in its experience of raising funds for the typhoon victims in Quezon and Albay provinces in 2004. Small contributions worth 5 or 10 dollars from different communities in the United States as a response to Fr. Manoling’s plea for Filipinos abroad to help their kababayans have generated enough amounts to help in the relief and rehabilitation of the peoples in the said areas. Tanging Yaman belief is also supported by its experience up to now, when the beneficiaries of Tanging Yaman have grown to include scholarships to college and formation studies, children’s basic needs, and environment and livelihood; this expansion made possible by every generous donor who cared to give their 2-mites’-worth of love and compassion to our fellow Filipinos. 1. When was Tanging Yaman Foundation, Inc. established? Tanging Yaman Foundation, Inc. (or simply Tanging Yaman) was registered as a non-profit Philippine organization in 1996. 2. What prompted the establishment of Tanging Yaman then? In 1992, Fr. Manoling--or Fr. Mano, as he is fondly called--performed his liturgical compositions with the Philippine Philharmonic Orchestra, various artists and choirs. Their first beneficiary was the Alagad ni Maria Youth Center, Infanta, Quezon. Since then, Fr. Mano would stage similar yearly concerts and donate the proceeds to a selected beneficiary. To facilitate the work of raising funds through such concerts, Tanging Yaman was established. 3. Who were some of the beneficiaries then? 4. What has happened since then? Tanging Yaman was inactive from 2000-05 while Fr. Mano pursued graduate studies in the USA. Upon returning to the Philippines in 2005, he gathered several of his friends to re-launch the Tanging Yaman. In December 2004, four consecutive major typhoons hit the Philippines, devastating Quezon Province and the Bikol Region, among others. Fr. Manoling emailed as many of his friends in the USA to send their donations for Bikol and Infanta through him. While he hoped to raise 2000-3000 USD, to his surprise, so many people responded to his email appeal that his volunteers of Filipino graduate students in Boston and he were able to send more than 750K PhP to Bikol and Infanta. Most donations were of small denominations--$10, $20, $50. Fr. Mano realized that there is so much goodwill among Pinoys in the US, which has not been tapped yet. So many people in the US want to help Pinoys back home but do not know how to help and how to send their help. Fr. 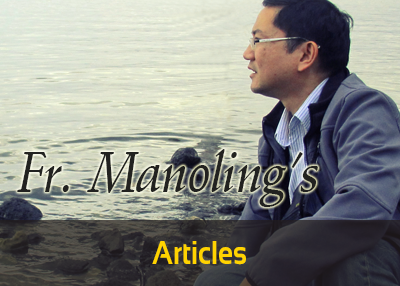 Mano organized a group of Filipino consultants across the US to help him jumpstart the new Tanging Yaman. Upon returning to the Philippines in 2005, he gathered several friends to help reactivate Tanging Yaman and pursue its new thrust. 5. What is the new thrust of Tanging Yaman? To help create a culture of giving. One need not be a millionaire to be able to help others. Everyone can do a little to help others in greater need. To bridge those who are willing to give with those in need. Tanging Yaman is a conduit organization that links donors with beneficiaries (NGOs, parishes, schools, etc.). A family can pledge perhaps P500/mo. or a fresh graduate P200/mo. Tanging Yaman will link with as many NGOs, parishes, schools as possible, which have worthwhile projects that others might want to support. A prayer group might want to support a seminarian; a mountaineers’ club a reforestation project; a group of elementary school children an endangered species. Tanging Yaman will provide all the mechanisms available so donors can send their donations in whatever mode they are most comfortable with--cash, check, credit card, text, internet, etc. 6. Do Tanging Yaman projects have a more specific coverage? 7. Who are some of our beneficiaries? 8. How can people help Tanging Yaman? 9. What are the future plans and hopes of Tanging Yaman? To set up networks of donors among Filipinos in the USA, United Kingdom, Saudi Arabia, Hong Kong, Japan, Italy, etc. People Behind Tanging Yaman Foundation, Inc.